Thessaloniki was founded in 316 BC by Kassandros who married the sister of Alexander thw Great, Thessaloniki, and gave her name to the new city. The city was fortified since its establishment, but the present walls date from the early Byzantine period, ca. 390, and incorporate parts of an earlier, late 3rd-century wall. The walls consist of the typical late Roman mixed construction of ashlar masonry alternating with bands of brick. The northern part of the walls adjoins the acropolis of the city, which formed a separate fortified enceinte, and within it lies another citadel, the Eptapyrgion. Extensive rebuilding of the walls was carried out during the reign of Emperor Theodosius I the Great (late 4th-early 5th centuries) by Ormisdas, while frequent barbarian raids in the 5th and 6th centuries necessitated frequent reinforcement of the walls. 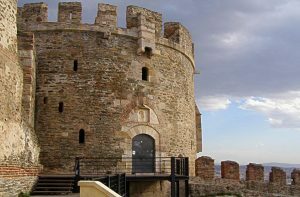 The ease with which the Saracens captured the city in 904 through the defenders’ negligence led to the walls being strengthened to resist the danger presented by the Bulgarians. Major repair work was undertaken again in the 13th and 14th centuries by the Palaeologan dynasty both to the walls (e.g. the Anna Palaeologina Gate) and to the Eptapyrgion (Acropolis). Venetian indifference facilitated the capture of Thessalonike by the Turks (1430), who then paid great attention to the city’s fortifications. 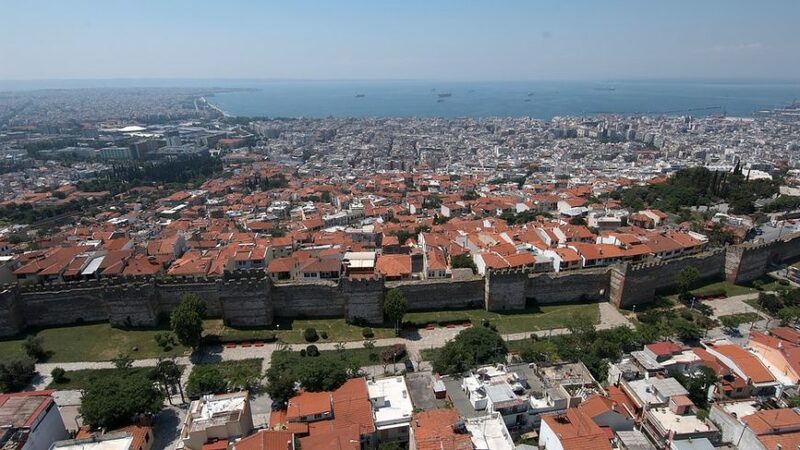 The Walls of Thessaloniki surrounded the city during the Middle Ages and until the late 19th century, when large parts of the walls, including the entire seaward section, were demolished as part of the Ottoman authorities’ restructuring of Thessaloniki’s urban fabric. 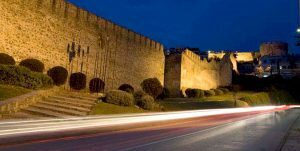 The walls of Thessaloniki were originally 7 km long. Unfortunately only 3 of them survive today. Fortified at intervals with towers and gates, the wall was a double one, at least in the more level sections, the inner and outer wall having a distance of ten metres between them. There were no gates in the sea walls, while the artificial harbour built by Constantine the Great within the walls had a low wall around it facing the city and a breakwater, the Tzeremboulon, on its seaward side. 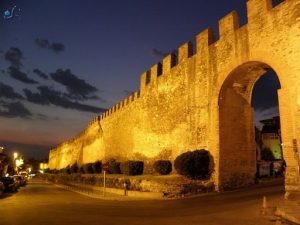 Transfer Thessaloniki is the best way to discover this beautiful walls! We are here to transfer you from Thessaloniki Airport to city center. Your transfer, is our pleasure!